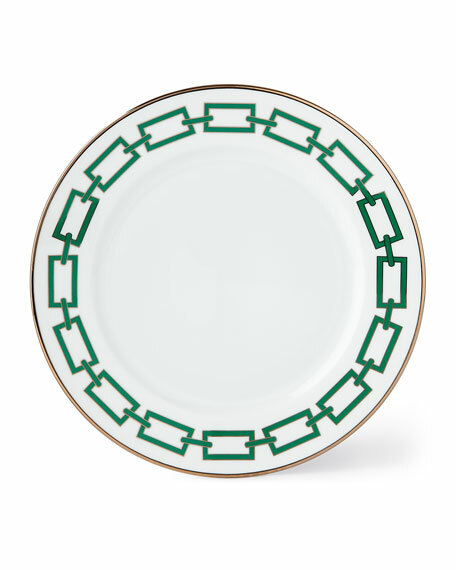 Hand-detailed porcelain plate with chain-link border. Interlace Placemat, 14" x 19"
Porcelain dinner plate. 10.75"Dia. 24-kt. gold detailing. Hand wash. Made in Hungary. White porcelain with goldtone edge. Scalloped lip, tonal floral pattern. 10 1/2" diameter. Imported; dishwasher safe. Hand-painted porcelain dinner plate. 10.5"Dia. Hand wash. Made in Hungary. This is a special order pattern. If not in stock, please allow up to 4 months for creation and delivery. Inspired by designs from the 19th century. 10.5"Dia. Softly hued turquoise with intricate goldtone patterning. Crafted of fine white French Limoges porcelain. Hand wash. Made in France.